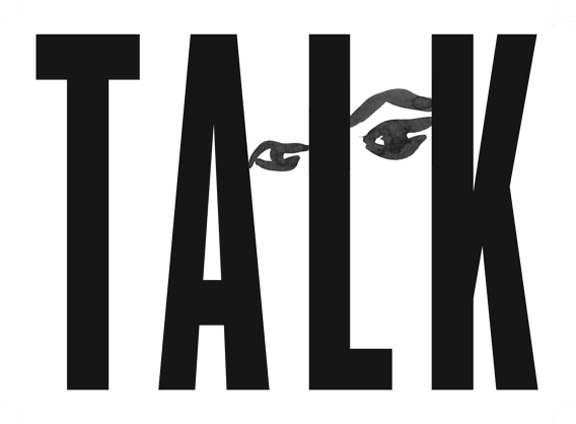 Tops Gallery is pleased to announce Talk, an exhibition of collaborative paintings by Dana Frankfort and Jackie Gendel. Frankfort, best know for her expressive paintings of words, and Gendel, best known for her figurative paintings of oblique dramas, share an interest in the painterly articulation of social interaction and utterance. The paintings in Talk were created over the past year with Frankfort and Gendel mailing canvases between their respective studios in Austin and New York. Each artist had the task to paint over the other's work and accept both the risk and surprise inherent in such collaboration. Dana Frankfort (born 1971 Houston, TX) has had multiple solo shows internationally including New York, Los Angeles, London, Brussels, and Turin. She is currently represented by Inman Gallery in Houston, Texas. Franfort received her MFA from Yale School of Art and also attended Skowhegan School of Painting and Sculpture. Frankfort was a Core Fellow at the Glassell School of Art at the Museum of Fine Arts, Houston in 1999 and a resident at Yaddo in 2010. She received a Guggenheim Fellowship in 2006. Frankfort lives and works in Austin, TX. Jackie Gendel (born 1973 Houston, TX) has had eleven solo exhibitions throughout the U.S. and internationally. Recent shows include consecutive solo exhibitions at Jeff Bailey, New York (the first being closed by the flooding from Sandy) and a solo exhibition at Loyal Gallery Malmo, Sweden. Her work has also been included in numerous group show at venues including On Stellar Rays, Artists Space, and White Columns. The American Academy of Arts and Letters awarded Gendel an Academy Award in Art in 2007. She participated in the Marie Walsh Sharp Space Program, New York in 2010 and was an artist-in -residence at The MacDowell Colony, New Hampshire in 2005. Gendel received her MFA from Yale School of Art in 1998. She lives and works in Brooklyn, NY. Tops Gallery is located at 400 South Front Street, Memphis, Tennessee (basement level, entrance on Huling), and is open for viewing most Saturdays and by appointment.